Many implementations of Maintenance Planning and Scheduling fail. Often because senior management was never on board to begin with. In this article I’ll show you how to fix that. 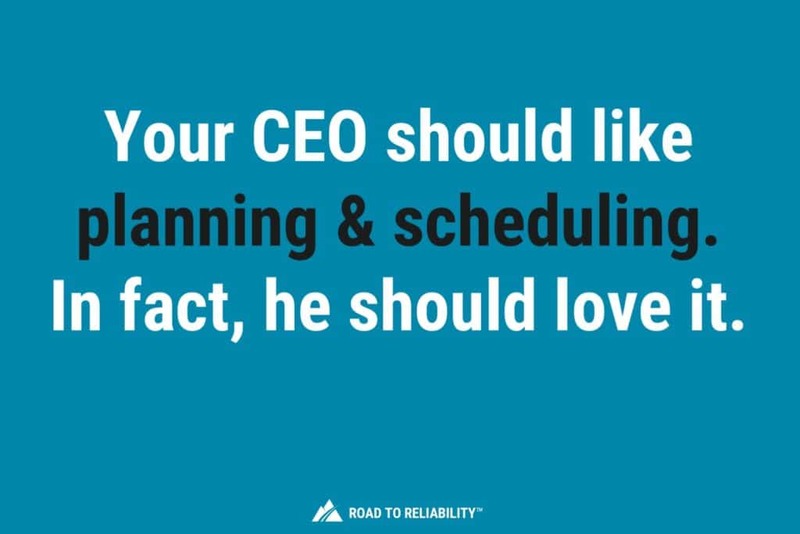 I’ll show you how to sell planning & scheduling to your CEO. And in such a way that he actually wants you to implement it successfully. I’ll talk about your ‘CEO’, but it could also be your Plant Manager that you need to convince. Implementing Planning & Scheduling is a critical step in fighting your reactive work environment. And often it’s the first step in your journey to World Class Maintenance. You must get that first step right. Planning and scheduling is one of the biggest improvements you can make in your journey to reliability. But it doesn’t come easy. And like most things in life it doesn’t come free either. It will cost you time and money to implement a robust work and productivity management system. And for most organisations that will mean getting approvals from senior management. So the question is: how are you going to sell the benefits of maintenance planning & scheduling to your management, to your CEO? When it comes to selling something you have put yourself in your customer’s shoes. What’s in it for them? Before you try to pitch work management to your CEO because ‘it’s what we need’. Or because ‘that’s what everybody else does’. Think about it from your CEO’s position. What’s in it for him? Work management will result in productivity improvement, which reduces costs. Effective maintenance planning and scheduling reduces emergency work. And Emergency work has been shown to cost 3-4 times that of well-planned and scheduled work. So more cost savings. Good work and productivity management will reduce equipment downtime so it increases production. More production means more profit. And the stable working environment that comes with planning & scheduling is better for safety. In short, there is a massive return on investment for implementing maintenance planning and scheduling. Your CEO should like it. In fact, he should love it. But it gets better. Few maintenance improvements drive so much benefit for so little upfront investment. And it is relatively easy to demonstrate the benefits up front. There are plenty of case studies, benchmarks and literature sources available to back up your claims. It should be an easy pitch really. But somehow it seldom is. And frequently the message is lost in translation. That is a loss for you and a loss for your CEO – even if he doesn’t know it. So here‘s a step-by-step framework to help you sell maintenance planning and scheduling to your CEO. If your organisation is like any typical organisation, chances are it’s been a while since the CEO has been out on the shop floor. It will have been a while since he talked to the maintenance crew to see how things are going. Most likely your CEO doesn’t know he has a problem in this space. So why would he want to spend time and resources on a solution for a problem he doesn’t know he has? Make it simple for him to see the waste, to see the problem, to see the lost value. You see the real hands-on productive time of a typical maintenance worker is somewhere around 20% to 30% if you take into account all forms of waste. And this is not something I’ve made up. Those numbers are well established in benchmarking case studies and industry literature. The first thing you need to do is to assess the size of your maintenance productivity problem. That means you identify all the various forms of waste and calculate your wrench time. When you start this productivity assessment I strongly recommend keeping it simple. To ensure credibility you need talk to supervisors and other stakeholders to get an idea of how much time is lost on typical activities like finding parts, getting tools or waiting on permits. But keep it simple and don’t go overboard. Don’t kick off an exhaustive time and motion study or statistical analysis of hands on tool time. That can come much later. If you don’t have a sound work and productivity management system in place your maintenance productivity is likely to be between 20% and 30%. Spending a massive amount of time and energy to determine whether your wrench time is 27.6% or 31.4% is just a waste. Instead, use that energy on understanding the essentials of work management. How to successfully implement it. And equally important, how to sell work management to your CEO and the wider organisation. Once you have completed Step 1 you’ll know your typical wrench time. And you’ll have an idea of how big your productivity problem is. Let’s assume your wrench time is 30% and that you aim to get this to a very realistic 45%. That’s pretty typical for a well-functioning work management system. But certainly not world class. When you show your CEO that your current wrench time is 30% and explain your aim to bring it to 45% you’ll need to talk him through the basics of effective planning and scheduling. You need to explain in simple terms how you’re going to fix this productivity problem. At this point, it is still very much your problem – not his. This shouldn’t be too hard to do. The purpose of maintenance planning and scheduling is to ensure the right work gets done, at the right place and time, with the right tools, materials and people. All with minimal waste. And I won’t go into the details of maintenance planning and scheduling in this article. You can read a detailed overview of maintenance planning and scheduling here. For the purposes of this article, just remember that you need to talk your CEO through the basics steps of work and productivity management. And show him how they solve your productivity problems. You’ll need to highlight that maintenance planning and scheduling is a process. A business process that will require people to work in specific roles like that of a planner or a scheduler. Roles you may not yet have in your organisation. So at this point, it is crucial to reinforce to your CEO that you do not necessarily need more people. By changing the way you work you will get more out of your existing staff. Chances are your CEO will ask why the heck you aren’t already doing this. Once someone understands work management it is hard to see why you wouldn’t work like this. It might lead to some uncomfortable moments, but this is exactly what you want. It means your CEO gets it and that’s an important first step. At this point, you have clearly demonstrated that you have a productivity problem. And you’ll have explained that there is a well-established, robust process to help you improve your wrench time. But that won’t be enough for your CEO. You need to show him the money. Don’t stick to generic benchmarks. Instead, calculate the value work management will bring to your organisation. Show him how you will improve his bottom line. Well if you haven’t already downloaded our Wrench Time Calculator go ahead and do that right now. The tool not only helps you to calculate your wrench time as required in Step 1. It also calculates the value of implementing work management in your organisation. When you open the Wrench Time Calculator and go to the tab for Step 3 you will be asked to enter your current wrench time. Let’s assume that’s 30%. And you need to enter a target wrench time. Let’s set that at 45%. That’s not an arbitrary number. Benchmarking and industry experience show that effective maintenance planning and scheduling can increase your wrench time to 45%. World Class organizations achieve around 55% wrench time. But that’s not what we’re after here, at least not in the first instance. You need to calculate your current productive hours without work management based on your existing crew size. Then calculate your productivity once you put in place work management and have dedicated planner(s) and scheduler(s) in your team. The difference is your productivity improvement, or productivity gain. I’ll walk you through the example that is in the wrench time calculator. Assume we have a small organisation with 20 technicians who work five 10-hour shifts per week for 48 weeks per year. A typical industry ratio of planner to technicians is 1:20 to 1:30. In other words, an experienced planner in a stable, non-reactive maintenance environment should be able to plan work for 20 to 30 technicians. Let’s assume the bottom end of that ratio and we have twenty technicians without planning & scheduling. These 20 technicians work at a typical industry average wrench time of 30% for a 10-hour day. That means over the course of a week they can liquidate 20 x 10 x 5 x 30% = 300 productive hours of maintenance work. We now introduce planning & scheduling. But we promised the CEO that we would not need more people, so we take 2 technicians and make one a planner and one a scheduler. That leaves us with 18 technicians, but after a transition period, we will achieve the typical 45% wrench time across their 10-hour days. That means that we now liquidate 18 x 10 x 5 x 45% = 405 productive maintenance hours per week. Even though we reduced our number of technicians we have gained 105 productive hours in a single week. 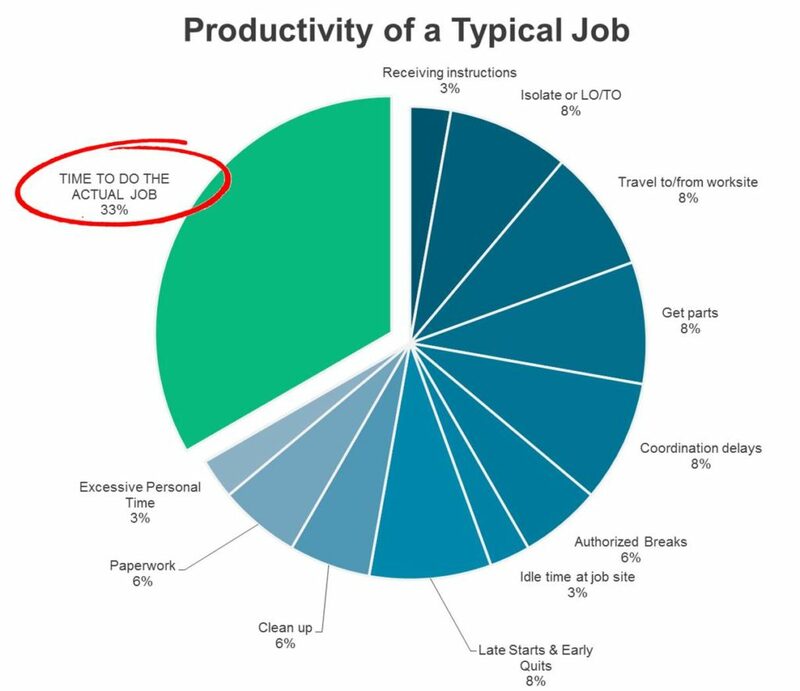 That’s is a 35% productivity gain! The conventional way to increase your manhours by 35% from a 20-man crew would be to hire another 7 technicians. And that is the beauty of maintenance planning and scheduling. You achieve that same 35% increase in productivity without recruiting any additional staff. That 35% productivitya improvement equates to 5040 hours of extra work done per year. Assuming a nice round value of $100 per hour the monetary value of that productivity gain is worth over $500,000 per year. $500,000 this year, $500,000 next year, $500,000 the year after and value will keep on rolling in. When you implement maintenance planning and scheduling across large sites or large organisations with potentially hundreds of technicians the value work management delivers is simply massive. Run this calculation for a larger sized organisation with 200 technicians, putting in place 8 planners and 2 schedulers and you will create over $6 million worth of value each and every year. And that is exactly the way to sell work management to your CEO – by showing him the money. You now have clearly demonstrated the value planning and scheduling will bring to your organisation. But as I said in the introduction: planning & scheduling doesn’t come for free. It will take time and money to implement, something we’ll talk about in detail in another article. And finally, you need to allow time for the overall project management to implement these changes. Change management efforts should be a big part of this. Once you have the total picture of the costs, time and resources involved summarize it and compare it to the value planning & scheduling will bring. You should see a payback within 12 months. With all the groundwork done you now need to create the opportunity to sell this to your CEO and other stakeholders. Prepare a simple presentation using the graphs and data you generated using the wrench time calculator. You only have a few minutes to pitch this and only one chance, so you need to get it right. Keep the message simple, effective and short. Focus on the bottom line benefits, avoid jargon and enjoy the opportunity. Sow the seed with your CEO and other stakeholders that this is a change forever – not just a once off program. That planning and scheduling is an Essential Step on The Road to Reliability™. Have you tried to sell Maintenance Planning & Scheduling? Leave a comment below to let us know how it went or if there is anything we can do to help. Planning and scheduling partly work out while implementing work management. Often maintenance technicians spent time on modifications and other activities, Now I want to understand production department involvement to improve RCM and how? Top management doesn’t encourage to develop planning and scheduling effectively? Hi Suman, lots of questions there. When it comes to maintenance technicians working on non-maintenance tasks there are two ways to manage that. You either put those tasks in your weekly schedule or you reduce the amount of available time you have for the week by deducting the time required to do the other tasks. I prefer to the first approach by including all tasks into a single schedule as that drives efficiency and discussions around priority. As for top management not supporting planning & scheduling, thats exactly why I wrote this article: to give you an approach on how to explain (sell) the value of planing & scheduling to management! Good to read this again Eric. I feel that the principal applied here for Maintenance, can be mirrored when considering organisational effectiveness? Again, investment in a PMO for instance may seem like a large investment, when existing environments have done ok? Using your process has helped me to ‘spread the word’. Excellent Miguel! feel free to reach out if you need any help or support. Erik, can you tell me what sources did you find this data of calculation? I know better my manager, he will ask me for the source certainly. Hi Pablo, the numbers quoted in the article are typical industry numbers that I have observed myself, but very similar to what you would hear from various industry experts / consultants. However, what you need to do is to establish YOUR numbers. Simply download the wrench time calculator, put in your assessment of your plant’s productivity and some other details and it helps you calculate the value planning & scheduling can bring to your organisation. If you have any doubts or further questions feel free to drop me an email. Previously, we used to have a planner who is doing planning and scheduling jobs. Nevertheless, the organisation has changed to include a scheduler who cares about (Who and When) while the planner focuses on (What and how). Frankly speaking we have not yet realised the benefit out of this change as the scheduler is still under training. But such a change looks promising in the long run! Great article. God bless you. Hi Erik. I am in charge of maintenance department in a metal sheet forming plant. In our maintenance organization there are 10 fitters, 1 young engineer and me as a manager. Unfortunately we do not have CMMS and we are still in reactive phase. At this moment we have simple work order system (production manually fill in a work request and then maintenance provide a respective work order). Based on this we are doing failure analysis (RCA) and planned maintenance. We are just ready to go with preventive and autonomous maintenance, but I didn’t officially start with this because we do not have people dedicated to execute PM jobs. I proposed new maintenance organisation which include PM crew, few supervisors and one planner. 1) Can we work with one guy who will work as a planner and a scheduler as well? is there any similar and successful case? 2) I was thinking to appoint one of my best fitter as a planner. He is a mechanical fitter with secondary school. What kind of training I should organize for him? 3) I saw a lot of firm are hiring maintenance planner and they request only few years of experience, and university diploma. Am I crazy because I want to have my experience fitter as a planner? 4) Is it possible to start planning and scheduling without CMMS? 5) When you started to implement planning and scheduling, did you provide a procedure that clearly describe responsibility and information flow? 6) in production organisation which consist of a welder or an operator, then a line leader, a supervisor and a production manager, who should be the lowest level in production organization that have a permit to issue a work request? 7) Shell be a work authorization within a work order system? In other word if every of 20 line leader is permitted to issue a work request, shell be someone above who should prioritize work requests so maintenance can know where to go first? (1) with those numbers I would indeed recommend combining the planner & scheduler role, but you have to realise they require very different skill sets. A Planner needs the technical/trade knowledge and experience of how a job is to be done, but the scheduler role is much more administrative. (3) I would rarely support making someone with a university diploma and little experience a planner, much better to get them to take on a role as a reliability engineer and focus on defect elimination and PM optimisation. To succeed as a planner you need to know how to do the jobs you’re planning and that is something you learn through experience, not in university. (4) yes, it is possible just less efficient, but then again many organisations have a CMMS and barely use it. Instead, focus on setting up a good planning & scheduling process first and then down the line consider opting for a simple, low-cost cloud-based CMMS that supports your process. (5) absolutely, you need to document how you will work, who does what, who makes which decision etc. Read my article on implementing planning & scheduling. (6) and (7) everybody should be allowed to raise a work request, but all work requests should be jointly prioritised by maintenance & production and then handed over to your planner to prepare. Make sure that you agree who owns the weekly schedule e.g. the production manager and he/she is the only person allowed to approve work requests that break into the weekly schedule. This person should be accountable for your schedule compliance KPI. thank you for most useful answers. I am tired of so general answers and tips about maintenance improvement. Most of them can not survive in real factory environment. Through professional knows what to take from his broad experience and knowledge, and to modify techniques and tools according to specific plant condition. Copy – past solutions can not pass real plant tests nor to withstand on the long haul. I would like to say, that good maintenance manager should create sustainable maintenance system which can perform well without having his attention on everything every day. At the end I would mention that topics that you cover, and your tips are quite useful for all of us. Regarding the wrench time calculator, I seem not catch your mind. I can’t understand how the planning & scheduling can reduce these step’s time listed in the calculator very well. Actually, to do one job, we have to go through these steps. The difference is probably who do and when do and persons’ skills and knowledge. These should decide the time consumed. Can you give one or two example to explain your idea on how P&S can reduce the time on performing these steps? A simple example would be the time taken for materials. It is very common that when you don’t plan work properly the technicians doing the work will end up having to go to the warehouse during the job to locate additional materials or parts. If you plan the job properly and make sure you have all materials ready in a box that the technicians can simply pick up at the beginning of the job you save a lot of time. Another example would be waiting on other trades. Say mechanics have to replace a pump but they need an electrical isolation to be in place before they do so. If you plan and schedule this properly the electrician will isolate the pump just before the mechanics are ready to remove the pump and so you have limited time wasted. In a reactive environment, the mechanics would come to the pump to replace it, realise they actually need an electrician and would then go around the plant to find one who could isolatethe pump for them. That’s a lot of time wasted, but unfortunately it is very common.